IR Baboon taught me physics! Sometimes, especially when sitting in an exam room, you need to have some prepared ‘memory jogs’ to help remember pesky little bits of information. Studying to understand is always going to be the best recipe for success, but there will always be certain things that your teen will need to rote learn. This is where mnemonic devices and acronyms come in. For example, a really common mnemonic device used in biology is “MRS GREN”. This acronym is used to help us remember the 7 characteristics of life (Movement, Respiration, Sensitivity, Growth, Reproduction, Excretion, Nutrition). Get your teen to make their own! Your mnemonics don’t need to be restricted by length — they can be entire sentences too &mdash just whatever works for you! So, MRS GREN could become: MR Sainsbury Grows Really Enormous Nectarines. Now picture, if you can, Mark Sainsbury sitting in his garden marvelling over the enormousness of his nectarines whilst explaining to you what the seven characteristics of life are. Creating an image that your teen can relate to and remember will increase recall and maybe even make studying at least a little more fun. 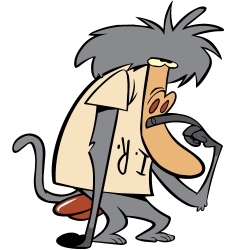 Back when I was at high school, there was a cartoon called ‘IR Baboon’. Not only did this show entertain me (judge if you must), it also helped me remember — for physics — that voltage was equal to current multiplied by resistance (V = IR) — because the I and R are found on the same side of the equation. Maybe you can make this into a bit of a game around that dinner table tonight. Pick any subject with a number of words or concepts that your teen will need to remember. There is no subject that you can’t use. One example could be the first 20 elements on the periodic table. Get the whole family involved and see who can come up with the best mnemonic or acronym. And of course, you can count on the Internet to help you too. For instance, you can go to this website — a site that will generate a completely random mnemonic based on the letters that you enter! If you have any examples of mnemonic devices that you or your teen like to use we’d love for you to share them in the comments section below! Studying – One Size Fits All?